It was a frustrating afternoon for Gavin Skelton`s side at The Cheaper Insurance Direct Stadium as for the second consecutive match it ended in a goalless stalemate. In a game which both teams lacked quality in the final third it`s fair to say a draw was a fair outcome for both clubs. The Doonhamers made two changes from last week`s stalemate against Hibernian. Grant Anderson returned to the starting line-up, with Dale Hilson dropping out of the match-day squad and seen on crutches in the stand. Derek Lyle was originally in the starting eleven but pulled a calf muscle during the warm-up and was replaced by Steven Rigg. Jordan Marshall recovered from the injury he suffered two weeks ago at Ibrox and made the substitutions bench. 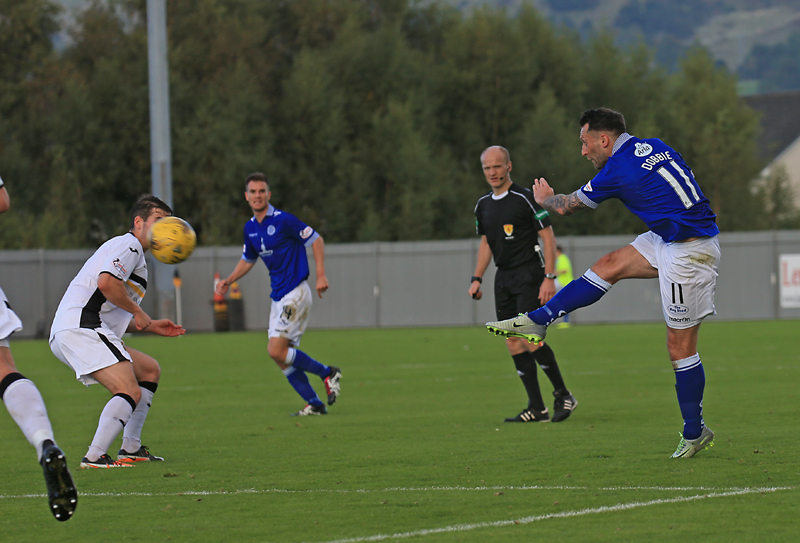 Former Dumbarton loanee Stephen Dobbie returned to the Rock for the first time since 2007 and looked to add to his impressive six leagues goals so far. The striker has played against three of his old club`s in the past 12 days. 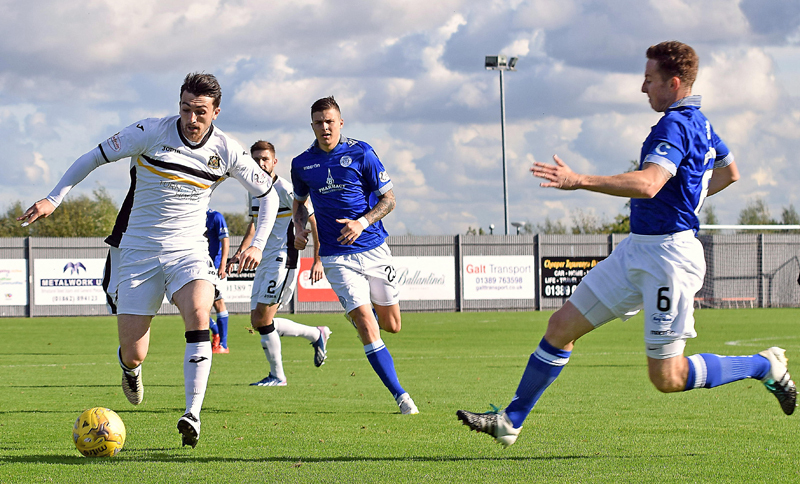 In Dumbarton`s ranks,ex-Annan forward Josh Todd started for Stephen Aitken`s men and they hoped to continue their impressive home outings against the clubs challenging for promotion this season. Skelton`s men enjoyed the majority of the possession in the early exchanges but couldn`t unlock the stern Sons defence. Queens could only muster up a half-chance on 9 minutes when Lyndon Dykes used his electric pace to get past Craig Pettigrew on the left and squared to Kyle Jacobs on the edge of the Sons box, but the South African couldn`t trouble goalkeeper Alan Martin and flew over the crossbar. Two minutes later, it was a case of de-ja-vu for Jacobs when Stephen Dobbie slipped the ball into the midfielders path but like his previous attempt, fired his effort well over the bar. The hosts have done well in their home fixtures this campaign and looked dangerous when they had the ball. Their best chances of the first-half came three minutes apart when striker Robert Thomson received the ball from ex-Ayr United midfielder Ryan Stevenson 25-yards out, and turned past Darren Brownlie to force a good save out of Queens `keeper Lee Robinson. Dumbarton continued to pile on the pressure when Stevenson`s free-kick from the left was flicked backwards by Jamie Hamill into the path of Thomson, the strikers header clipped the post before being scrambled clear by Darren Brownlie. It was the visitors turn to try and open the scoring on the half hour mark, the ball fell to Steven Rigg in the Dumbarton penalty area but the Englishman couldn`t adjust his balance and dragged his shot wide. The match needed the opening and elusive goal but it was the Sons who wasted another chance to take the lead. A David Smith cross went over the head of the Queens` defence and found Stanton at the back-post but the Hibernian loanee showed no composure and blasted over. It looked as if Queens couldn`t get out of first gear and moves which were flowing a few matches ago, weren`t this afternoon. Dykes won the ball in an aerial challenge and sent Grant Anderson down the right, who crossed in a powerful cross for Dobbie in the box but was superbly blocked by the right-foot of Mark Docherty. Moments later, Anderson used his strength and pace to get past Pettigrew on the right but the former Raith man showed no composure and his cross caused no problems for the Sons defence. It was down the right where Queens were creating chances, and Anderson got in behind left-back Daniel Harvie once again, knocked the ball back to Hamill and the right-back`s long delivery found Lyndon Dykes at the back-post but his header was deflected out for a corner. 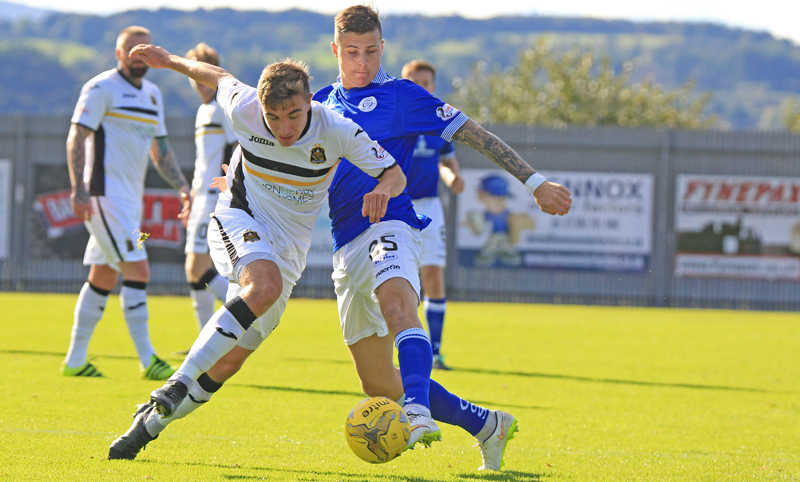 The Doonhamers started the second half the strongest and had another half-chance five minutes after the restart. Dobbie picked the ball up on the left, skilfully beat off Pettigrew laid off to Hamill who passed back to the striker but he couldn`t add to his impressive goal tally and dragged his shot wide. Skelton`s men passed up another opportunity to go ahead when Hamill`s inch-perfect cross found Rigg but his header was easily collected by Martin. The visitors were heaping on the pressure and when a clearance from the Sons defence fell to Jacobs on the edge of the box, his low shot looked to be heading goal wards but took a deflection on the way and out for another corner. Hamill took the resulting set-piece which Andy Dowie leaped the highest at the front post but his header drifted wide. Queens were nearly made to regret their wasted chances on the hour mark when Stanton sprinted into the Doonhamers penalty area from the left, but he chose to have shot rather than square to Thomson in the middle and could only hit the side-netting with his left-footed attempt. Both sides were getting visibly frustrated with their missed chances and the visitors had their hands on their heads once again when Dobbie floated a cute cross to Anderson but the right-winger`s effort lost pace after clipping Docherty and went straight into the safe hands of the `keeper. Queens made their first change of the afternoon, livewire Dean Brotherston replacing Grant Anderson on the right-hand side of midfield. But it was Aitken`s men who had the next chance when a well-driven cross from the right was headed over from close range by Thomson. Brotherston introduction was finally having an impact when he got past his marker and sent in a superb cross which found Rigg in the middle but the striker`s header flashed wide of the post. Skelton shuffled his pack for the second time with ten minutes remaining, bringing on Jake Pickard for Rigg. Queens had a late half-chance when Higgins` throw-in found Dykes in space but his strike drizzled wide and summed up the Doonhamers` afternoon in front of goal. It may have been a frustrating afternoon for Skelton and co., but they remain top of the Championship table (for at least another sleep) and are still unbeaten in their last eight league games. Next up we turn our attention to the Irn-Bru Cup where we take on Northern Irish outfit Linfield at Palmerston on Sunday lunchtime. 14:37 Sons Xi; Martin, Pettigrew, Docherty, Thomson, Stevenson, Todd, Thomson, Stanton, Harvie, Barr, Smith. 15:00 The players are out and we`re fast approaching kick-off. 8 min Dobbie cuts in from the left but his cross is cleared to safety. 11 min Dykes passes to Jacobs and the South African`s shot flies over the crossbar. 18 min Stanton`s cross is too long for Thomson. Still 0-0 here. 19 min Smith`s long-range effort is easily saved by Robinson. 21 min Dobbie slips the ball to Jacobs 20-yards out and Jacobs fires his effort well over. 23 min Ball falls to Rigg in the box but his effort drags wide. 29 min Thomson`s header clips the post. A let-off for the Doonhamers. 29 min Anderson breaks away and wins a corner for Queens. 37 min Anderson manages to get past Pettigrew but shows no composure and slices his cross over the bar. 39 min Corner for Queens. 43 min Hamill`s long delivery finds Dykes but his header is deflected out for a corner. 46 min Hamill drives in a cross to Dykes but couldn`t get enough on it to trouble the `keeper. 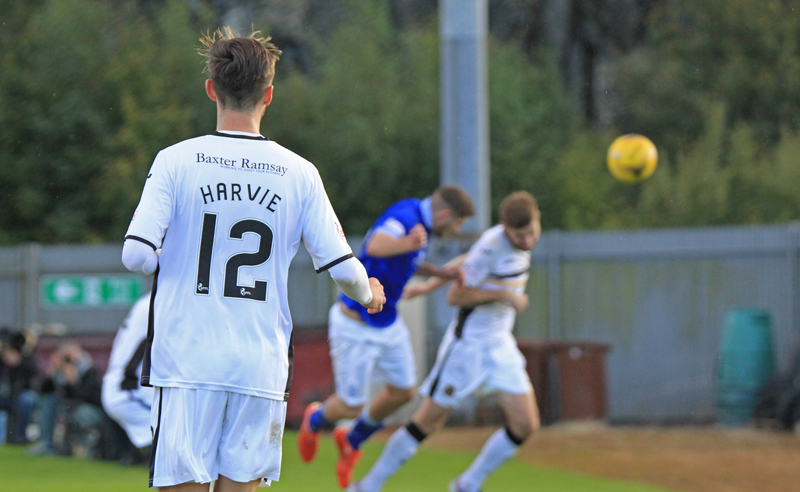 47 min Dobbie`s long-range shot is inches over the bar. 50 min Hamill`s cross finds Rigg but his header is saved by Martin. 51 min Jacobs shot deflected wide for a corner. 57 min Ball in from the right lands to Dykes but he can`t get his effort on target. 62 min Stanton`s strike hits the side netting. Still 0-0. 65 min Dobbie floats a cross in but Anderson can`t finish it. 69 min Dobbie is fouled by Docherty just outside the box. Hamill to take. 70 min Hamill`s low powerful free-kick goes inches wide. 72 min Thomson`s header goes over the bar. 80 min Brotherston is fouled by Stirling on the right. Hamill to take the free-kick.